Really late getting this out this week, but it has been a very hectic 24 hours. I have about 3 posts I need to write up. U.S. crude oil refinery inputs averaged over 15.4 million barrels per day during the week ending April 13, up 372,000 barrels per day from the previous week’s average. Refineries operated at 90.4 percent of their operable capacity last week. So, as I have been saying, refineries continue to come out of their turnarounds. Total motor gasoline inventories fell by 2.7 million barrels last week, and are below the lower end of the average range. Total motor gasoline imports (including both finished gasoline and gasoline blending components) last week averaged over 1.0 million barrels per day. So, imports are relatively high, refinery capacity is quickly returning to normal, but inventories are still being drawn down. 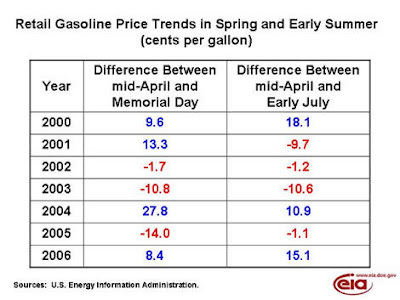 Gasoline levels are now at levels not seen since the aftermath of Hurricane Katrina. The last time inventories were this low in mid-April was 2003. However, when they hit this level in 2003, they did rise the following week. So next week should be a good indicator of what’s in store. If inventories fall again next week, we will have to go back to 2001 to find a similar inventory level. And I don’t think I have to mention that demand is much higher now than it was 6 years ago. On a “days of supply on hand” basis, if I go back to 1991 – which is 841 data points, this week’s days of supply on hand is the 12th lowest during that time. In other words, in the past 16 years, 98.5% of the time we have been in a better gasoline inventory situation then we are in now. I would also point out that in April, over that same time frame this is the lowest day’s supply on hand that we have had. The 2nd lowest? You guessed it. The week before. So, this is not a typical situation. (But I will go out on a limb and say that within 2 weeks the gasoline inventory trend will reverse direction). Unless more imports hit the shores soon, I think we will continue to see higher pressure on prices. But, the author of This Week in Petroleum doesn’t necessarily buy that, as I will show in just a second. U.S. commercial crude oil inventories (excluding those in the Strategic Petroleum Reserve) decreased by 1.0 million barrels compared to the previous week. This has been expected, as refineries coming out of their turnarounds will tend to draw down crude as they gear up for high demand season. U.S. crude oil imports averaged over 9.9 million barrels per day last week, up 115,000 barrels per day from the previous week. Over the last four weeks, crude oil imports have averaged 9.9 million barrels per day, or 84,000 barrels per day more than averaged over the same four-week period last year. Doug MacIntyre, the primary author of This Week In Petroleum (TWIP), stopping by again! Thanks for linking to us and pointing us out as a useful resource. We certainly try to provide taxpayers their money’s worth. after 4:30 pm ET on Mondays), even with gasoline inventories continuing to decline. But gasoline production is up, refineries are coming back, and hopefully, gasoline imports will rise, all adding to supply and hopefully, reversing the inventory trend [I also expect the inventory trend to reverse within 2 weeks, but this year has been abnormal]. Some of the inventory decline recently may be a dumping of winter-grade gasoline to make storage room for summer-grade [but, this is the lowest days of supply we have had on hand at this time of year since at least 1991]. The big questions are how much (or little) will retail prices fall, and will they rise even higher later this summer? I believe these are still tough questions to answer at this point, but I would expect to see retail prices starting to come down, if not this coming Monday (Apr. 23), then perhaps by Apr. 30. In response to that, I would say that it just depends on inventories. We are going into high-demand season in worse shape than we have been in for a while. Unless the trend reverses (gasoline stocks have declined for 10 weeks now) then I do expect prices to continue trending higher. Although on a week to week basis we might see no change or even a decline in prices, I think on a month to month basis falling inventories will continue to keep upward pressure on prices until the demand is brought back into balance with available supply.